Brick Town Talk: The Building Process - LEGO Town, Architecture, Building Tips, Inspiration Ideas, and more! I don't know about you, but whenever I build something, it is usually based off something I saw while on a trip or something that's been eating away at my conscious for awhile. 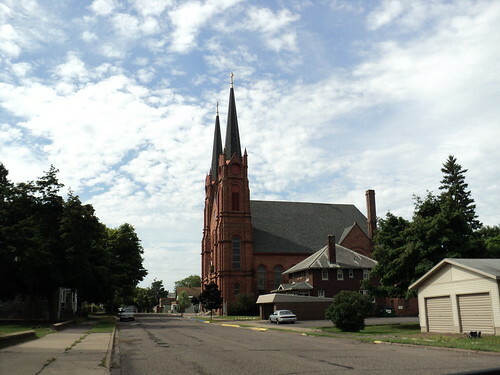 For example, after visiting Calumet, in Michigan's Upper Peninsula, I was inspired to build a church. 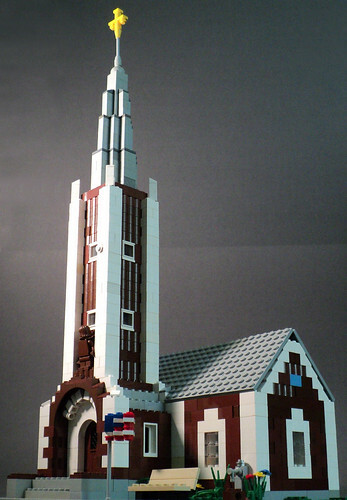 What inspires you to build? And then there are the problems faced while building. It can start at any moment. Not sure what to build, how to build it, the lack of pieces, or the sudden change in mind. What problems do you face? How do you fix them? I would just like to hear your thoughts and comments on the matter. I think I build differently than a lot of people do. I've spent a lot of time figuring out how to put the bricks together, and then when I find something interesting, I try to build something to show that technique off. I haven't tried building something pre-conceived yet. I do run into problems with not having enough pieces, though sometimes, that can be a good thing. I then have to try to come up with some creative solutions to the problem, and that often ends up with better results than if I had just had the pieces I had wanted. Solving the engineering problems is the best part about Lego building, to me. There's always a way that it can be done, though it might take some creative thinking to see how. I start with an idea of how it will look, and then try to stay consistent with a style. For instance, if the castle is supposed to be early Norman (plain), don't add too many fancy details just because it'd look cool. As for changing my mind, I do that all the time. It might require a big tear-down and rebuild, but I'll do it if it's practical. The hardest thing for me is having a lack of pieces. I try to make things consistent, then I realize I don't have all the pieces I want. Then I have to buy more pieces, which is a hassle and usually doesn't end up happening, so I end up with, for example, a corner building with one design and set of details on one side and another design on the other. I tend to build much the same way as Anthony and n.a.krueger. Unfortunately, I'm currently lacking some of the darker basic colored bricks and haven't built in awhile. I need things consistent! Katie...That's very interesting! I don't think I've ever really done anything like that, but for someone who runs out of the proper number of pieces, like yourself, that could prove to be a very efficient technique.